The first eleven months of 2011 have come and gone and the Alamo real estate market has rolled along. While we have seen a decrease in the number of homes sold versus last year it is nice to see that pricing is holding steady. The median single family home price is hovering around $1,100,000. Marketing times have also held steady with it taking right at two months for a home to find a buyer. The attached home segment of Alamo is small and has shown the same strain concerning value as the surrounding communities of San Ramon, Danville, Blackhawk and Walnut Creek. One month left in the year so we will see how it all wraps up in early January. 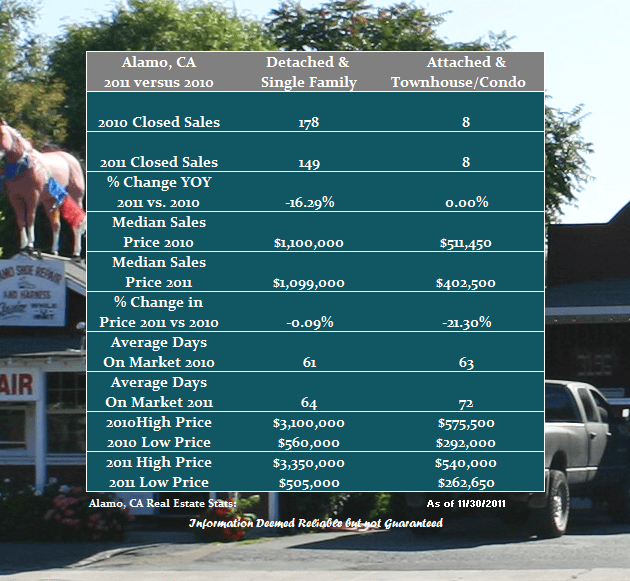 Share the post "Alamo 2011 Real Estate Review thru November"